We’d love your help. Let us know what’s wrong with this preview of Choosing Courage by Peter Collier. To ask other readers questions about Choosing Courage, please sign up. Each chapter features a different soldier. The stories are succinct and are a nice, brief overview of their life and the courage they possessed in difficult times. Some of these stories are more quiet acts of courage, which I appreciated. Not every story is about throwing yourself on a grenade, etc. These are not soldiers that were in it for the glory. These are people who did what they needed to do, regardless of the danger their own lives were in. I appreciate the few female stores (there prob Each chapter features a different soldier. The stories are succinct and are a nice, brief overview of their life and the courage they possessed in difficult times. Some of these stories are more quiet acts of courage, which I appreciated. Not every story is about throwing yourself on a grenade, etc. These are not soldiers that were in it for the glory. These are people who did what they needed to do, regardless of the danger their own lives were in. I appreciate the few female stores (there probably could have been more - even from earlier wars). I also appreciated the story of a mother who lost a son. A variety of disciplines and wars are covered in this book. It's easy to skip around and read what interests you, as each chapter is about a different individual. This book is simply amazing. I just couldn't put it down. And it usually takes me at least two weeks to finish a non fiction book. Some of the quotes were so inspiring. I think everyone should read this book. I LOVED IT!!! I finished this a while ago, but it was a pretty good book. I usually don't like reading biographies or auto-biographies, because they're usually pretty boring. But this book, even though it's a collective biography, had an actual story line, and each small story was interesting and intense, making me want to read more. The collection has stories by different authors, so the writing is uneven. That said, I found lots to love about this book and the hero's stories therein. Have you ever wonder what your grandparents did when they were younger? This is your chance to see what they went through but through a different point of view. What they have be through. Where they were when what ever happen to them.This book tells whats happen during the wars and what happened to the people that served in the wars. The author of my book is Peter Collier. He has wrote the book named Wings of Valor. He has won the medal of honor foundation. He typically writes historical fictio Have you ever wonder what your grandparents did when they were younger? This is your chance to see what they went through but through a different point of view. What they have be through. Where they were when what ever happen to them.This book tells whats happen during the wars and what happened to the people that served in the wars. The author of my book is Peter Collier. He has wrote the book named Wings of Valor. He has won the medal of honor foundation. He typically writes historical fiction. He also likes to write fiction books. My book is fiction. The intended audience for this work is people that like books about wars. The purpose of this book is to teach people about what happened in the wars. The books audience would be people that like book that have different points of view. This book has different places the author puts you. The main theme of this book is about how the wars were.They contribute to the work by talking about the wars.They are effective because they talk about how the people were treated. The book can not be effective because most of the people don't like talking about what happen to them. They contributed by letting them talk about what happened to them. I would describe the particular style is boarding at first. It can be accessible to all if they like a boarding start. It can also be just for some. I would describe the author’s particular style can be good. Most people won’t read this book. The argument was is set up by talking about the past wars. He asks people from the past war to talk about what happened to them.The work does fulfill the purpose. It also supports the argument. The support comes from people that what to talk about what happened to them in the past war. The main idea is to talk about the past wars. It makes it good for people to learn about the past wars. They wanted to get the story out about the war they were in. They wanted to tell what happened to them. They wanted to tell wanted the government did. There is no main characters. The main point is to talk about the past wars. There isn’t a main character. The main purpose is to get people get understand the wars that were going on. The main purpose to get people to understand what was going on and what happened to them. The author does provide revealing information because the book talks about war. The guest author does not provide the introduction. There are no judgments about the book. The author can’t make a preconceptions about the book. There can’t be any judgments or preconception about the wars. There are character that do work. The principle characters change in the different points of view. They affect the story by telling their own stories about the wars. I do empathize with them. They also affect the story by letting the author write in his own words. 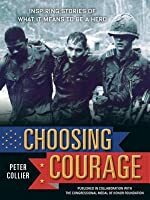 In Choosing Courage, inspiring true stories of what it means to be a hero by Peter Collier, you take a journey into the past where you experience heroic stories that the soldiers/heros got medals of honor for. They got these medals for the people they have single handedly fought off like Tibor Rubin. The heros who have saved lives, like Desmond Doss. There are people who wanted to fight for justice and the good of our country, like Vernon Baker. These recognized of the many soldiers have shown c In Choosing Courage, inspiring true stories of what it means to be a hero by Peter Collier, you take a journey into the past where you experience heroic stories that the soldiers/heros got medals of honor for. They got these medals for the people they have single handedly fought off like Tibor Rubin. The heros who have saved lives, like Desmond Doss. There are people who wanted to fight for justice and the good of our country, like Vernon Baker. These recognized of the many soldiers have shown courage for the better of our country. In everyday life, we can lose the importance of standing up and having courage. Author, Peter ebrases that hero’s put courage before themselves so we may find courage to do the same for someone else. Choosing courage is a interesting book, full of twists and turns of true heart pounding action stories. It might catch the eye of readers who like adventure, non-fiction, and historical literature. Their might even be readers who enjoy other war based novels that might like choosing courage for its real written knowledge. Peter has a way of giving us the real stories of the people in our history of the united states that is very informational and inspirational. CHOOSING COURAGE tells the stories of Medal of Honor winners from World War II, Korea, Vietnam, and Afghanistan. Each profile begins with general information about the subject -- birthdate/death date (if applicable), hometown, dates of service, and a quote. The stories are separated by conflict and told chronologically, starting with WWII. In between some of the profiles, there are short articles about subjects related to the conflict or time period. This will be a good book for teens interested CHOOSING COURAGE tells the stories of Medal of Honor winners from World War II, Korea, Vietnam, and Afghanistan. Each profile begins with general information about the subject -- birthdate/death date (if applicable), hometown, dates of service, and a quote. The stories are separated by conflict and told chronologically, starting with WWII. In between some of the profiles, there are short articles about subjects related to the conflict or time period. This will be a good book for teens interested in the military and survival stories. It's very accessible and I really like how the author gives brief overviews of each of the conflicts and the corresponding time periods. For many teens, even 9/11 is before they were born, and sometimes it's easy to forget that. I love reading more about history and military books which is why I liked reading this book so much. The book goes through many wars and many peoples stories. The book has so many stories of medal of honor recipients from WWII to Afghanistan, while also having the stories of civilians in 9/11 and school shootings. With all the different perspectives in the book because it is a person's story it keeps you really intrigued because no one is is the same. This books was a great read and a very well I love reading more about history and military books which is why I liked reading this book so much. The book goes through many wars and many peoples stories. The book has so many stories of medal of honor recipients from WWII to Afghanistan, while also having the stories of civilians in 9/11 and school shootings. With all the different perspectives in the book because it is a person's story it keeps you really intrigued because no one is is the same. This books was a great read and a very well written and well organised. This is a great book for someone that likes to learn history or likes to learn about wars and the military/wars. "I did a superman dive on the grenade but when I got hit I wasnt" (Page 24). I love this line because it shows the definition of a real hero and a selfless person. It shows that some good people put others first before themselves. One other good quote in this book is "Do your your best and put no shame on your family." (Page 96). I like this passage because it shows the value of your family and how you want to keep a good name on your family. This is an excellent book that tells the story of several men and women who were honored with the Medal of Honor. The book does great honor to all who served and as many of the Medal recipients said, they are just holding the medal for all who served. Good stories that make the reader appreciate those who chose courage. If not you - then who? If not now - then when? I rated this book at five stars because it had many engaging short story's that were filled with action and heroic actions. Also the story's were ordered in chronological order, starting in the early 1900s war stories and going up in years. Some of the stories were very emotional and some were just very moving. I learned a lot about how grateful we should be for everyday heroes. I learned a lot about military heroes, and how hard they work to keep our country free and to assist in the freedom/protection of other countries. There were a lot of things that made me think about simple everyday situations where we can choose to take care of others, no matter what else is happening. We often forget men and women are sacrificing so much to keep us safe from terrorism and other horrors. This book is a great reminder of the unbelievable lengths people will go to in order to carry out their mission of saving others. True heroes! If you need your faith restored in humanity, this is a great read! I found this book very interesting. These people put their lives at risk and saved others. They did not win The Medal Of Honor, they were honored it. This book is very good for anyone that is interested in the military and US History. I gave this a 5/5 because it is very inspiring. Name that Book 2017-2018/Lonestar 2017-2018. I enjoyed many of the true stories found in this book, and appreciated that it gave background information about the history surrounding the stories. I would have liked fewer stories with more details, but overall found the book interesting. I completely recommend reading this book because it talks about what people have gone through, what they have lost and what they did in order to gain something and it made me more appreciative for what I have and made me realize that some people have it harder than others. I think I started reading this book last year, but I don't remember if I ever finished it. An easy read and short selection of MoH recipients’ stories, but nonetheless inspiring and thoughtful. I chose some different stories to read out of this book. They were all quick to read and inspiring. This is a very inspirational and humbling read. It's also a strong reminder of the importance of standing for our flag. Freedom is not free. It's a great book if you love to learn about wars. And peoples stories during the world. It has a very strong subject, being war. It has many details of people who have earned the Medal of Honor. Founder of Encounter Books in California, Collier was head publisher from 1998-05. He cofounded the Center for the Study of Popular Culture with David Horowitz. He does many projects with this red diaper baby turned rightwing zionist. He publishes on his website FrontpageMagazine. He was also coorganizer of 2nd Thoughts conferences for leftists who'd moved right. Librarian Note: There is more than Founder of Encounter Books in California, Collier was head publisher from 1998-05. He cofounded the Center for the Study of Popular Culture with David Horowitz. He does many projects with this red diaper baby turned rightwing zionist. He publishes on his website FrontpageMagazine. He was also coorganizer of 2nd Thoughts conferences for leftists who'd moved right.